This St. Patrick's Day, make sure you wear some green, and after you share a few drinks with your friends, pull out some festive cigars. El Cigar Shop offers unique premium cigars to enjoy on St. Patrick’s Day. Nothing screams St. Patrick’s Day quite like a cigar and your favorite beer or Irish whisky. So, this St. Patrick's day, make sure you wear some green, and after you share a few drinks with your friends, pull out some festive cigars. El Cigar Shop sells the light green Candela cigars year-round, though most are sold around St. Patrick’s Day. It’s important to note that the lime green color doesn’t distract from the quality, flavor, or value of the cigar. Candela cigars are a nice change of pace, lighter and sweet with a distinct flavor that can be described as grassy that will appeal to the novice and beginner smoker. The Ogre Toro by Asylum 13 is a Nicaraguan Puro rolled in a barber pole style with dual Nicaraguan Habano and Candela wrappers. These visually stunning cigars have smooth-savory flavors of cream, pepper, chocolate, and a grassy sweetness. The ACID brand of cigars by Drew Estate is the king of infused cigars. ACID Blondie Candela from master blender Willy Herrera is an ultra-secret blend of aromatic infused tobaccos blanketed in a sweet, mellow apple green Candela wrapper. The petite corona is rolled Cuban-style with a pigtail. ACID Blondie Candela is cured for months in the blending room to release over 150 types of oils that make the ACID series so special. The wrapper creates a plethora of exotic flavors including notes of herbal tea and sugar. This March brings the anticipated arrival of the Alec Bradley Filthy Hooligan, a limited-edition smoke from the company’s Black Market line. 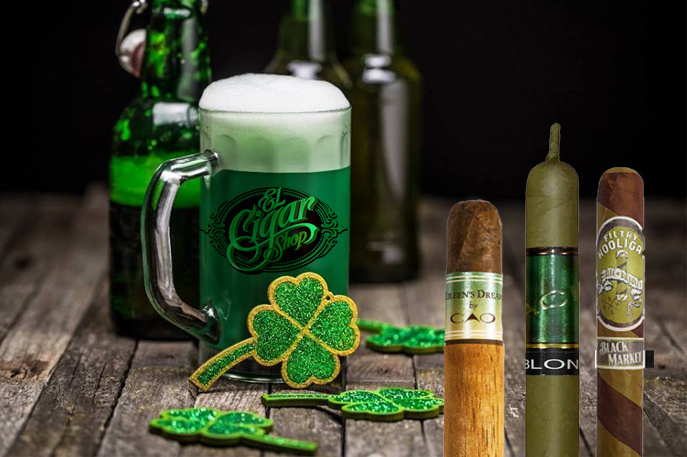 The St. Patty’s Day classic is rolled barber-pole style with a Nicaraguan blend that is interwoven with a shamrock-hued Honduran Candela wrapper. The 2019 Black Market Filthy Hooligan limited release is presented in a handsome green and black striped box containing 22 cigars. These have just arrived to buy cigars online at El Cigar Shop. Eileen’s Dream by CAO is a blend of smooth Dominican filler tobacco, Connecticut Broadleaf binder, and a spicy Cameroon wrapper. The cigarillos are infused with Irish whiskey, cream, coconut milk, and white truffles. When you only have 10 minutes to enjoy a flavorful smoke and enjoy flavored cigars, look no further. When you are on a messy St. Patty’s Day pub crawl and want to pair your Guinness or Jameson with a premium cigar, El Cigar has many options. Rocky Patel The Edge Habano is for the seasoned smoker. For those who are looking to offset the strength of the Edge, pair it with a brew and this will take the edge off ever so slightly. The coffee and chocolate elements present in Guinness Extra Stout refresh the palate and leave a pleasant taste. Quite possibly the best possible pairing within the stout class. The unique attributes of Irish whiskies are that they are distilled only in Ireland, distilled 3 times, made from unmalted barley and matured for at least 3 years. The Undercrown Shade Gran Toro is a balance of Ecuadorian Connecticut wrapper enclosing Sumatran binder and Dominican Criollo 98’ and Nicaraguan Corojo and Criollo long-fillers. With notes of nuts, cedar, subtle spice, and sweetness from the outer leaf, it pairs very well with a nice Tullamore Dew 12 Year. The CLE Chele is a milder offering by Christian Eiroa and a rehash of the original CLE which was a powerhouse of blast-your-face-off strength and flavor. This version is lighter and more floral than its big brother. Pairing CLE Chele with Jameson Original is a no brainer. The light body and similar notes of vanilla and floral aspects greatly complement each other and help draw out each other’s hidden flavors. It’s flavorful and light the whole way through to help kick off the St. Patrick’s Day holiday. Irish coffee is a traditional drink for St. Patrick’s Day morning. Paired with a tasty cigar, it is a great way to celebrate the holiday. Together, Drew Estate and Rocky Patel collaborated to create this superbly constructed and equally tasty blend cigar; Java Mint. Light up a minty, chocolaty, and sweet Java Mint, and you have an Irish whiskey or coffee and cigar pairing that was truly made for each other. Tell us what cigar you will be celebrating with this St. Patrick’s Day! Be sure to follow us on Facebook | Instagram for more article releases and new cigar updates!